In the new millennium, religion, its relation to the state and mutual respect are hot-button issues across the globe. In Flushing, Queens, this very conversation started 350 years ago with the Flushing Remonstrance. The Flushing Remonstrance was drafted in 1657 and signed by a group of Flushing residents who were offended by the persecution of religions outside the established Reformed Dutch Church. This document is considered by many to be a precursor to the Bill of Rights’ provision for freedom of religion. Throughout 2008, the Queens Borough President’s Office will offer cultural programming in conjunction with over 15 New York City (NYC) institutions to honor this most historic anniversary. 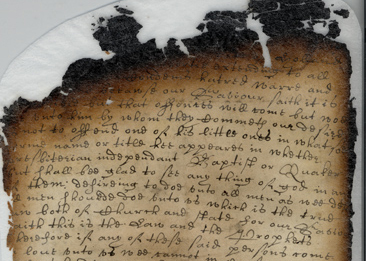 To commemorate the homecoming of the Remonstrance, QMA will present the original document in conjunction with images of historical materials from the New York State Archives. More than a show about the distant past, the exhibition seeks to explore the continued relevance of this unique moment of tolerance within our distinctively diverse environment. Embracing the notion that art can and should actively address and engage contemporary issues, QMA has invited five contemporary artists – Emmy Catedral, Takashi Horisaki, Sara Rahbar, José Ruiz, and Tattfoo Tan – to partner with religious institutions in Flushing to create works that respond to religious dialogue and exchange. Components of each project will be exhibited both in the Museum and in Flushing at participating religious sites. Four commissioned photographers – Kim Badawi, Jenny Jozwiak, Stephanie Keith, and Scott Lewis – will capture the religious variety of Flushing. R. Scott Hanson, Ph.D, a scholar of American religion, immigration and urban history, vividly showcases Flushing’s religious legacy in 203 Places of Worship in Flushing (as of 2007), a color-coded map revealing a vast religious landscape. Hanson has also contributed an illustrated timeline that traces both religious and immigration-related events in the area spanning the mid-17th century to the present. An open call invites photographers from all walks of life and religious persuasions to participate in a large display of images that celebrate religious freedom in this vibrant community. The Flushing Remonstrance is on loan from the New York State Archives, a program of the New York State Education Department. Courtesy of the New York State Archives, a program of the New York State Education Department.